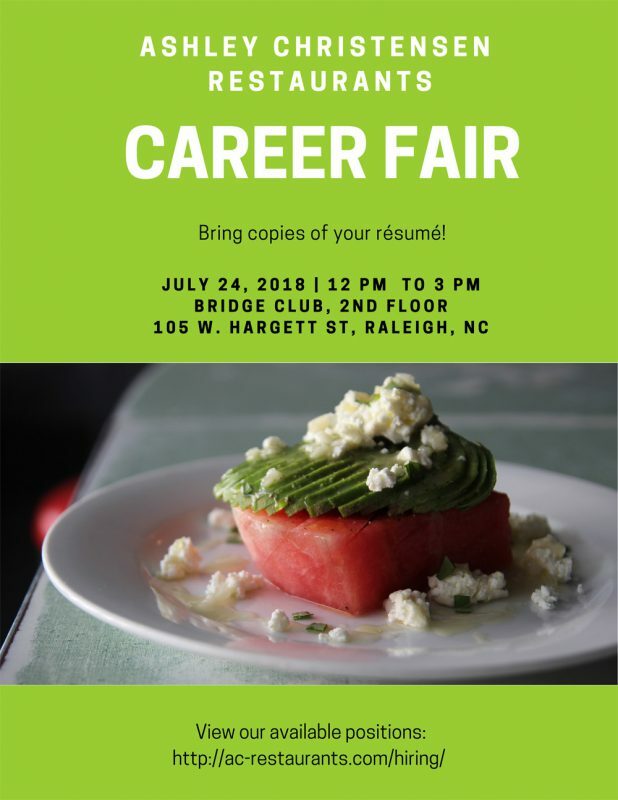 Take the next step in your career! We are hiring multiple positions and experience levels at AC Restaurants. Join us on Tuesday, July 24th to learn more about our open positions and apply on the spot! We are closed July 16thfor our annual staff appreciation day. While we’re away you can still enjoy our food, by using recipes from our cookbook, Poole’s Recipes and Stories from a Modern Diner. There are so many great recipes to choose from, but this time of year we’re particularly fond of making the watermelon salad. It’s one of our favorite recipes and it’s perfect for a hot summer day. Enjoy this recipe and we’ll see you on the 17th! 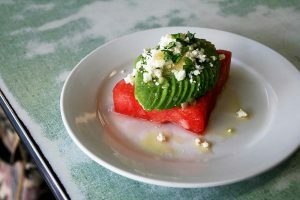 Place a watermelon slice on each of four plates and season with salt and freshly ground pepper. Cut each avocado in half, remove the pit, and carefully remove the peel. Thinly slice the avocado halves, leaving ½ inch at the top so that they stay together. Gently press at the center to form a fan. Season each half with sea salt and coarsely ground pepper. Place 1 avocado portion on top of each watermelon slice. Crumble 1 ounce of the chèvre over each plate. Tear the basil leaves into pieces and distribute over the four plates. Drizzle the vinaigrette over each plate and serve. For the sweet onion vinaigrette: In a mixing bowl, cover 3 table­spoons minced sweet onions with 1/3 cup champagne vinegar. Let marinate for 15 minutes. Using a whisk, stir in 2 teaspoons honey and a pinch of salt. Begin whisking the vinegar mixture in a circular motion. Slowly drizzle 1 cup neutral vegetable oil in a thin, steady stream, whisking continuously until all of the oil is added to the bowl and the mixture is emulsified. Season with salt to taste. As you make your Independence Day plans, please keep in mind some holiday hours at our restaurants. 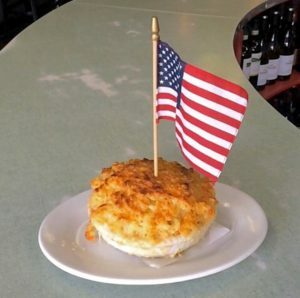 Beasley’s & Chuck’s will be open for regular business hours on July 4th. Please also note that ALL of our restaurants will be closed for business on Monday, July 16th to allow our hardworking staff to participate in our staff party. Tomatoes might be our favorite thing about summer. 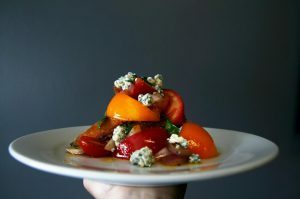 Chef Ashley Christensen, in particular, is a sucker for a fresh tomato—it’s often joked that tomatoes are her “spirit animal” in the kitchen, since they appear with so much frequency in her cooking. So, on June 28th we’re pairing tomatoes with another summer favorite: rosé! Join chef Ashley Christensen for a five-course tomato-centric dinner at our private events space, Bridge Club, where we showcase this amazing ingredient alongside rosé wine pairings selected by beverage director Cappie Peete! Tickets are $85 + Tax and Service (Total $109.01) and are available for purchase here. Here's the menu; join us for this truly special summer experience! As food people, we can't resist a good cookbook. 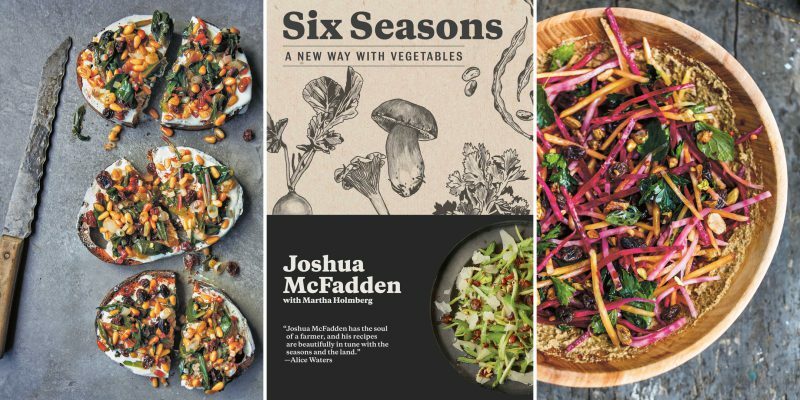 And it didn't take us long to figure out that Joshua McFadden's newly released cookbook, Six Seasons, was the kind of book that we would be cooking out of and turning to for years to come. Joshua is the chef at Ava Gene's in Portland, Oregon, but he started his career in New York, working at some of the top restaurants in the business, including Franny's and Blue Hill. His book documents the easter eggs of wisdom he has amassed over the years on cooking vegetables--his recipes are full of easy techniques that will stick with you for the long haul. We're thrilled to welcome Josh to Raleigh next week when we host him at Bridge Club for a cookbook party. 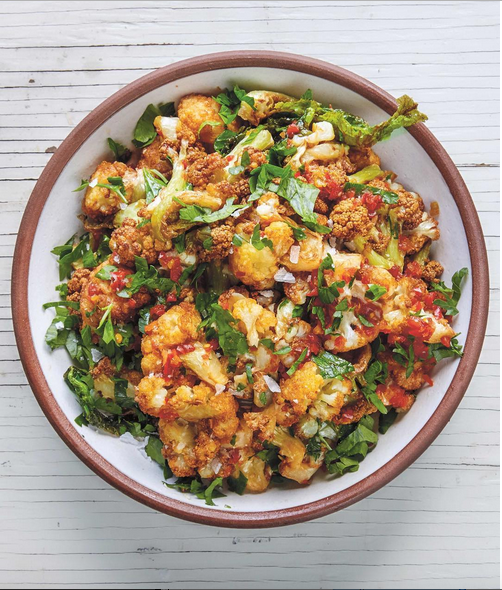 In deciding which of the many recipes we wanted to share with attendees, we couldn't resist a dish of fried cauliflower with spicy fish sauce. Josh was kind enough to grant us permission to share the recipe here. Make it at home, or join us on Tuesday to get a copy of Six Seasons (which Josh will happily sign for you) and snack on some of the dishes from the book. This recipe is the result of an experiment I did one day when I was working at a restaurant in New York City. I was cooking Brussels sprouts and trying to figure out what method to use to get them super crispy. I had sprouts going simultaneously in a sauté pan, the oven, the steamer, and I threw one into the deep fryer. I sort of forgot about that one, yanking it out only after it was almost burnt. And of course it was the winner—crisp, almost charred, and exceedingly sweet. Now I use the same method for many vegetables, cauliflower being ideal. You can serve it simply tossed with lemon, salt, and dried chile flakes; with a lime and freshly coarsely chopped garlic and parsley; or with a sauce or dip, as I do here. Put the garlic in a bowl large enough to hold all the cauliflower and add enough olive oil to cover. Pour at least 3 inches of oil into a medium saucepan with tall sides (so that the oil can’t bubble over when you add the cauliflower). Slowly bring the oil up to 365°F on a thermometer. Arrange a double layer of paper towels on a tray and set near the stove. Carefully immerse a few of the cauliflower florets into the oil and fry until they are really dark brown, about 5 minutes. Remove with a slotted spoon and drain on the paper towels. Repeat to fry all the cauliflower, taking care not to add too many florets at once, which would lower the oil temperature and make the cauliflower greasy. Toss the fried florets in the bowl with the chopped garlic and its oil, the parsley, and a big old glug of the fish-sauce sauce. You want enough to coat the florets and leave more for sopping up. You can also serve the cauliflower undressed, with the spicy fish-sauce sauce in a ramekin for dipping. Stir everything together in a small bowl until the sugar dissolves. Taste and adjust so you have an intense sweet-salty-sour-hot balance. Ideally, make this a day ahead, then taste and readjust the seasonings on the second day. The chile heat is likely to get stronger. The sauce will keep for a month or two in the fridge. Excerpted from Six Seasons by Joshua McFadden (Artisan Books). Copyright © 2017. Photographs by Laura Dart and A.J. Meeker.